In simple terms, the PRAFO® range is perfect for all patients with compromised mobility and at risk of developing pressure sores at the heel. Lack of mobility tends to increase the risk of pressure sores and we all know that the heels and ankles are vulnerable and can be subject to unrelenting pressure. If that pressure is too high for too long then the mechanics of the situation tells us that ulceration will result. Many clinical conditions also increase the risk by for example, compromising the blood flow, altering skin elasticity and influencing the nutritional status of the patient. Twenty years ago we were writing that pressure ulcers and foot wounds represented a significant burden to patients and to the NHS. These issues are still significant. At any one time, some 200,000 patients in the UK will have a chronic wound and in 2006 the associated costs were conservatively estimated at £3 Billion which is around 3% of total health care expenditure. Twenty years ago we were writing that with proper diagnosis and treatment much of this should be avoidable. In the USA at that time, developing a pressure sore in hospital was looked upon as a failure of nursing care. Today we are seeing this problem has not gone away and the trends are not positive. An ageing population, obesity, diabetes and many other factors are driving this problem and far from focusing on prevention it still looks very much like too many people are developing ulcers that should be avoidable. Whether a patient is in bed or in a wheelchair, pressure sores at the heel are important to prevent and difficult to treat. Having said that, we still see a lack of clarity about when pressure relief devices should be used and what type. There are now a vast range of devices from full mattress systems, orthotic devices like the PRAFO and very simple products that may help with pressure reduction but may not be adequate in all situations. So how do you choose which device to use in an individual case? The answer emerges by first focusing on the clinical requirement - put the choice of device to one side first of all. There are many possible devices that could be used today but the deciding factor for which device to use should always be based on sound clinical reasoning rather than just cost. It is important to think about what you actually expect a product to do and then identify products that meet that requirement. In many clinical cases you need a product that serves more than just a pressure relief purpose. Here are some situations in which heel protection will be important but there may also be a need for additional features and different protection strategies to meet overall clinical objectives. CVA – Stoke rehabilitation - contracture management and early mobilisation. For example, these are some of the broader clinical objectives we might have. Are wound dressings going to be in place on the foot and ankle? Do you need to accommodate existing equinovarus/contractures at the foot and ankle? Are you going to have to mobilise the patient in the device? High tone or spasticity may arise in some cases causing plantarflexion contractures that can be hard to deal with once established. Each of the spectrum of conditions which need heel pressure relief can also present with these wider challenges to clinical management. One PRAFO can be used on either the left or right leg and is adjustable in foot length and calf length. You don't need to stock a range of products with size and side variations. The PRAFO is the only device with a metal upright section. The reason this is important is that the device does not easily become displaced on the foot due to patient movement. In stroke rehabilitation a PRAFO can be used at night to resist the development of plantarflexion contractures which can delay mobilisation. 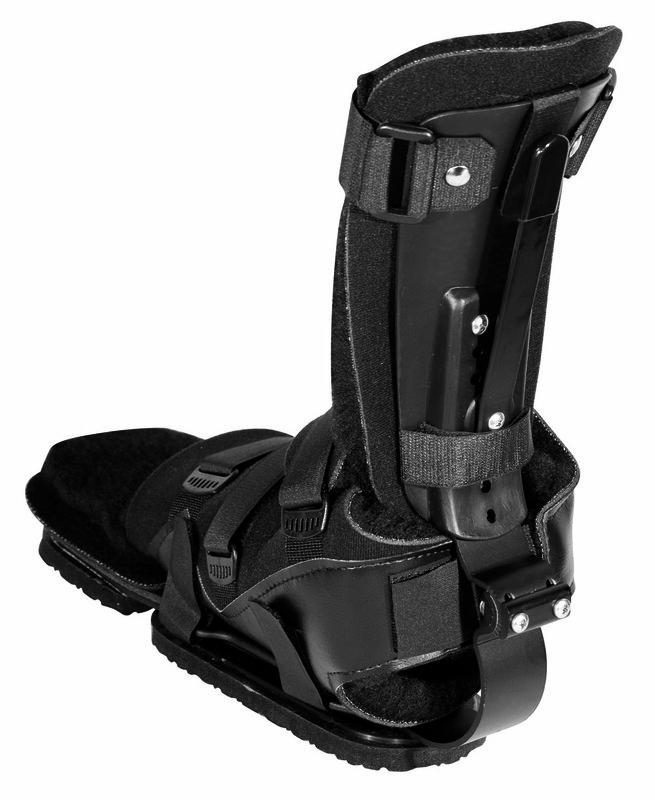 If you use an AFO that flexes too much you can cause pressure ulcers on the forefoot. The metal upright and intrinsic walking base allow the PRAFO designs to be used as an "evaluation" AFO immediately post-stroke and during rehabilitation to restore mobility. Last but not least - there is a fundamental truth here. "It is not what you put on a foot ulcer that heals it - it's what you take off - it is important to eliminate pressure and shear"
The PRAFO ankle foot range of devices ensure ZERO pressure and shear at the heel - eliminating the main cause of ulceration and providing the essential mechanical environment for healing.